Ref: (a) Title 10, U.S.C. 1. Purpose. To establish the Information Dominance Corps pursuant to the authorities contained in references (a) through (d). and provide guidelines concerning the corps. "The Information Dominance Corps will create a cadre of information specialists, who come with individual community identities and unite to be managed as a corps, developed as a corps, and to fight as a corps," said Vice Adm. Jack Dorsett, deputy chief of Naval Operations for Information Dominance. 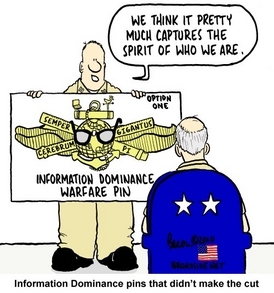 "This warfare pin represents a command identity for the Information Dominance Corps." The new officer insignia is a two and three-quarter inches by one and one-eighth inches, gold matte metal pin showing a background of ocean waves, a crossed naval officer's sword and lightning bolt with a fouled anchor and globe and will also be available in a miniature size. The enlisted insignia is a two and three-quarter inches by one and one-eighth inches, silver oxidized metal pin showing a background of ocean waves, a crossed naval enlisted cutlass and lightning bolt with a fouled anchor and globe and will also be available in a miniature size. Additional information is provided in NAVADMIN 058/10.